I have one restaurant I go to every time I visit Charleston, South Carolina. Butcher and Bee. When they first opened, the menu was written on a blackboard and changed daily. The only way to ever find the daily menu online was to look on the restaurant’s Facebook page. A few years later, Butcher and Bee opened a location in Nashville, TN so it was a required stop when Mr. Beet and I arrived in town. Now, both locations are full service restaurants with a menu that is more permanent, though it does still change on occasion. 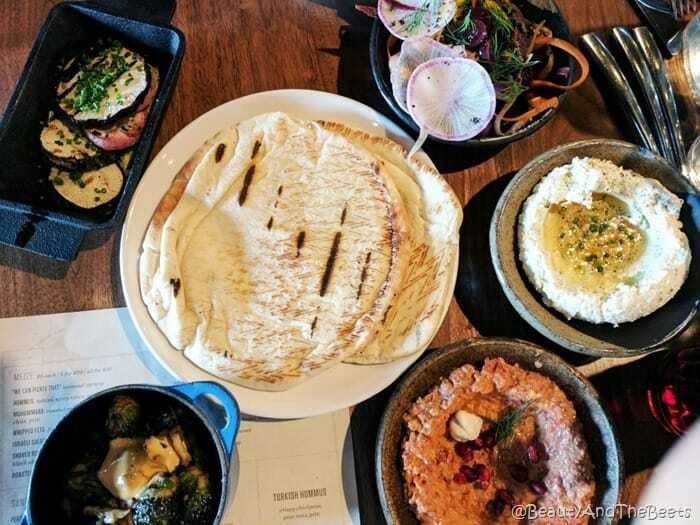 The small plates are a must, called Mezze on the menu (“mezze” is the Mediterranean word for appetizers). Offered at $5 a piece, or 5 for $20. Five plates can easily make a whole meal. 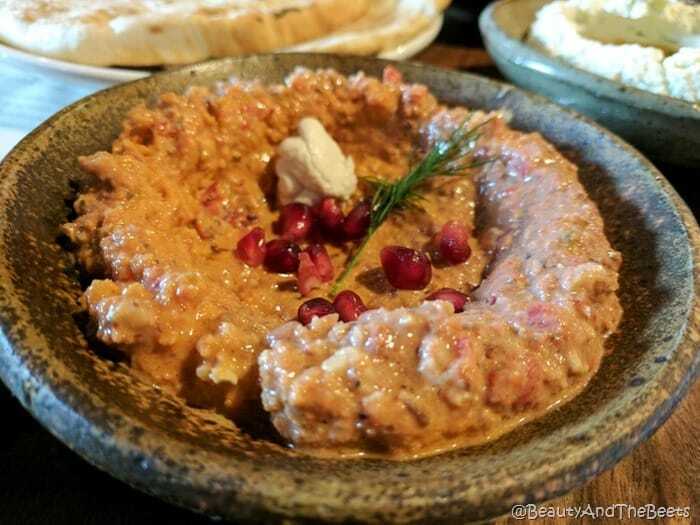 Mr. Beet’s favorite was the Muhammara – a dip made with roasted red peppers, yogurt, walnuts, and Calabrian chile (a spicy and fruity pepper). 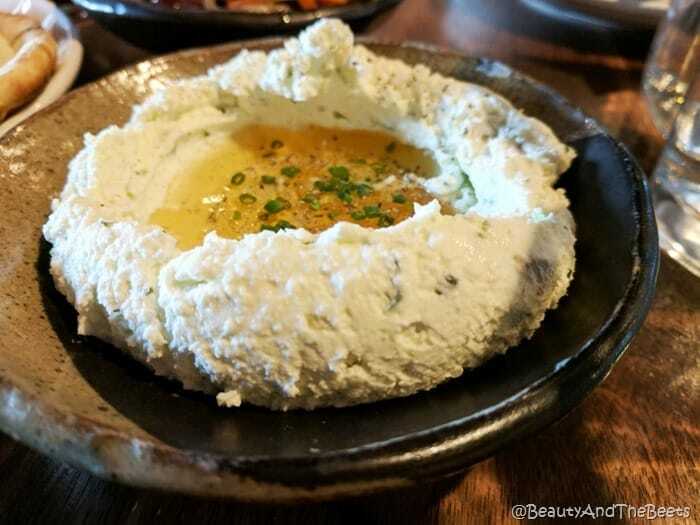 We also ordered the Whipped Feta with fermented honey. Both dips were very good and we were served the dips with a giant stack of pita bread. 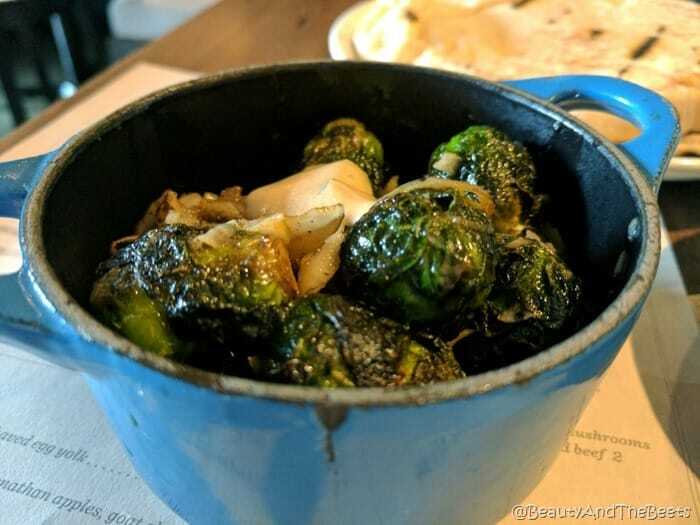 My personal favorite was the Brussels sprouts with Russian dressing and cabbage. The dish is normally served with pancetta but the kitchen was happy to leave that out for us. The Shaved Root Salad was amazing. 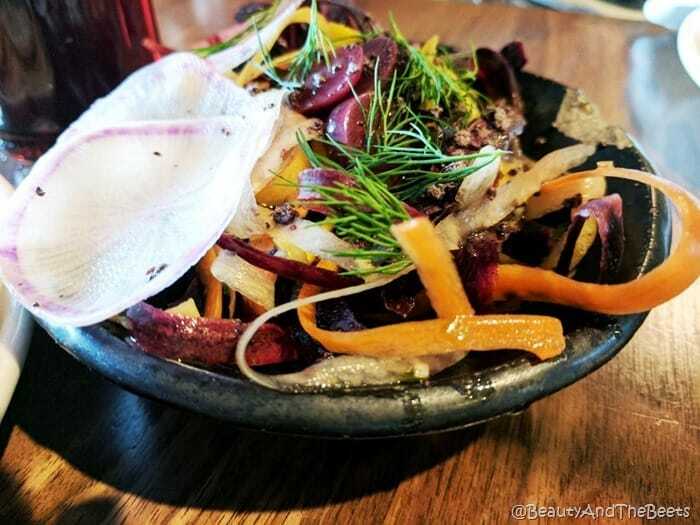 Root vegetables tossed in a sorghum chili vinaigrette and topped with crumbled black olives. To round out our Mezze choices, we tried the Grilled Radish with green tahini and shallot butter. 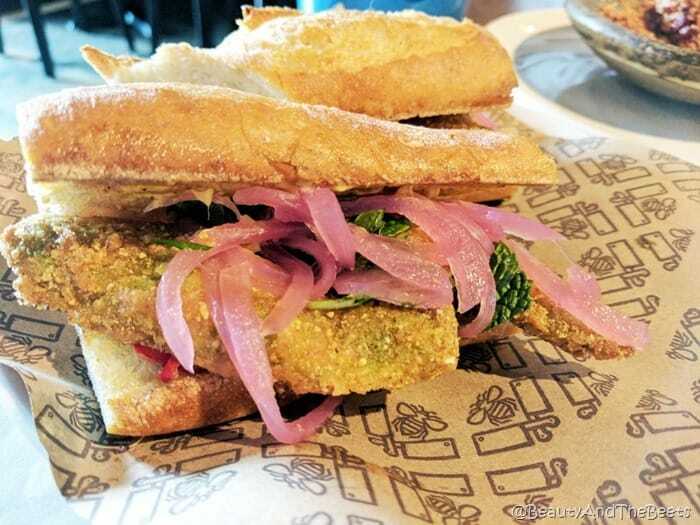 Because we splurged on so many appetizers, we decided to just get one entree to split – the Fried Avocado Sandwich with a sour mango aioli and pickled fresno peppers on a baguette. 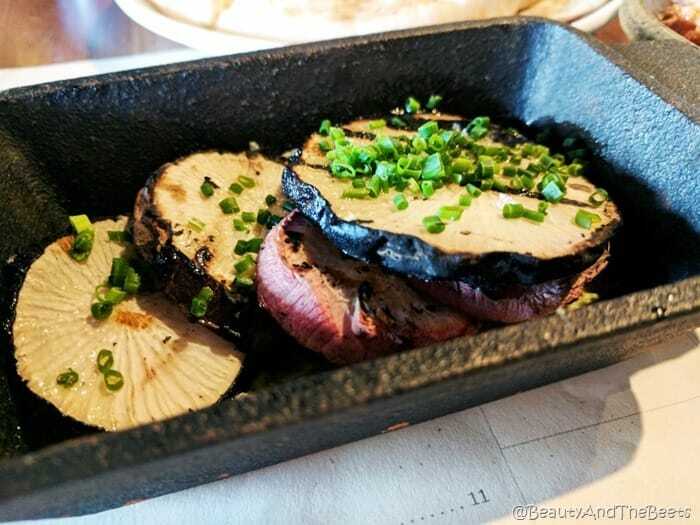 This is a pretty popular item as it seems to stay on the menu permanently despite the season. We loved it. 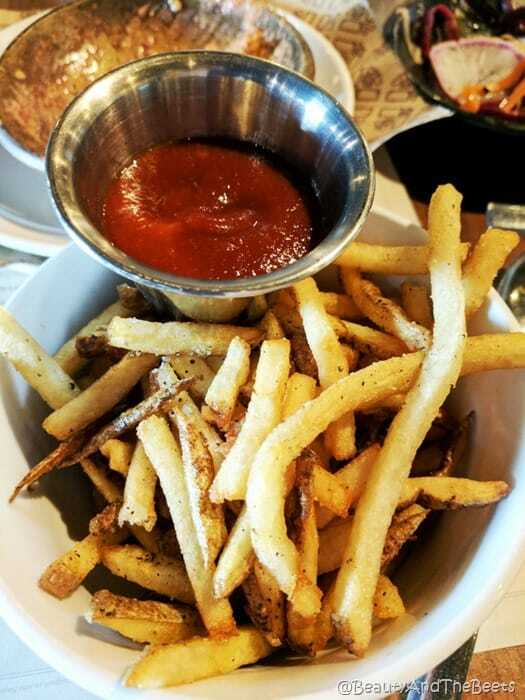 We also ordered a side of fries with house made ketchup. 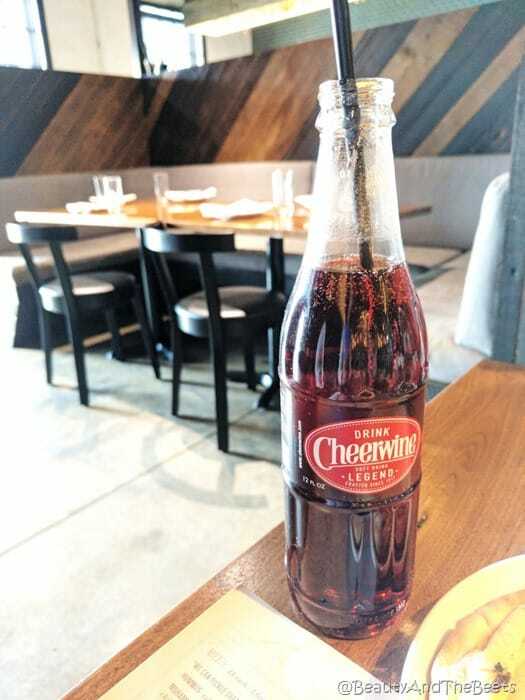 And just like in Charleston, the Nashville location also serves my favorite beverage – Cheerwine. Lastly, we couldn’t leave Butcher and Bee Nashville without having dessert. 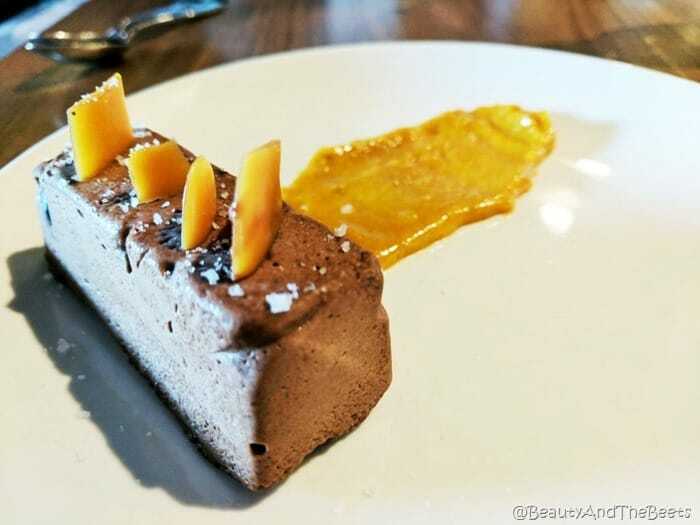 We tried the Chocolate Semifreddo with sweet amba and honey brittle. Semifreddo is a light and airy cake made from egg whites and heavy cream while amba is a mango pickle sauce in Middle Eastern cuisine. The combination of the chocolate and the mango pickle was Heavenly. 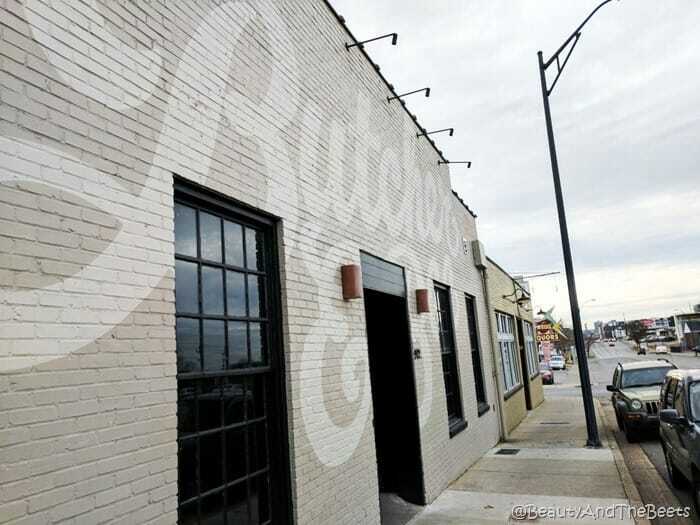 I love Butcher and Bee Nashville as much as the one in Charleston. I can’t wait to see where they take the restaurant too next. 5 out of 5 sprouts. I would LOVE this place. The food is so interesting and delicious sounding. I would have everything you had!!!!!! !